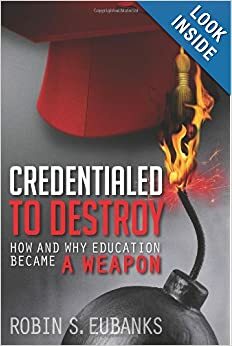 A Eureka Moment is when a piercing epiphany takes an area of concern over the effects I am seeing from some education reform and I discover that those very effects were part of the original design. It’s not as dangerous as a heroic rescue from a Thai cave, but it may be about as painstaking in its approach to detail. Regular readers know that I have been concerned for a while, especially in discussions in the comments of these posts over the last two years or so that the widely circulated narratives surrounding student privacy and the social and emotional learning standards simply do not track to the documentable facts about how learning standards like the Common Core or a competency framework really work. If that creates a gulp moment how about the desire to accomplish these feats via the italicized “will to govern through data and the will to govern data“? All the False Narratives I have encountered and fought to dispel through my book Credentialed to Destroy, and subsequently through this blog as they arise, make perfect sense suddenly if the accurate truth might defeat the desire of the “socio-political actors” funding those narratives and enacting the tools of ‘data-driven governance’, to “straightforwardly implement technologies of governance without meeting any kind of resistance.” In other words, FERPA redrafting or Student Data privacy Toolkits will not do anything to impede the data-driven governance agenda and GDPR actually helps cements it. Of course education standards get at those levels quite well and the co-sponsor, along with MIT Media Lab, is an entity called IEEE that also happens to have created the Learning Technology Standards that are a part of Project Unicorn when it is properly described. Good reason I suppose not to accurately describe it lest there be that warned about resistance. I revisited IEEE’s involvement recently after I cited the Hoover paper on math that did not reflect what the Center for Curriculum Redesign said was the new global purpose of math activities. One of the co-authors, Ze-ev Wurman, was shown as now working for IEEE, which seemed awfully coincidental. He has been speaking at Anti-Common Core forums for years. A bit more research into the acclaim for GDPR as supposedly protecting student privacy instead of enabling noetic manipulation led me to discover that Wurman is also listed as a fellow at the American Principles Project that has done so much to create so many of the False Narratives surrounding K-12 education reforms. The CXI vision cites to the template on “Happiness and Well-Being Policy as embodied in the first Global Happiness Policy Report,” which I happened to have read when it came out in February when it was released at the World Government Summit in Dubai. It pushes a vision of Positive Education that I noted after last year’s summit aligns with Betsy Devos’ rhetoric and recommended policies. http://invisibleserfscollar.com/subservient-and-malleable-students-devos-federalizes-our-moral-obligations/ What this year’s released report adds in that Policy Report is an address at the end that ties the entire agenda to a seminary across the street from Riverside Church near the Columbia University campus. In other words, what happened in Dubai was never meant to stay in Dubai at all. Without accurate information we are left tilting at windmills while all these plans avoid the needed scrutiny that would cause virtually all of us to resist. I hope these Eureka Moments can be the beginning of the resistance that is not bound up in narratives on data that serve as useful Guiding Fictions that actually enable ‘data-driven governance’ in the 21st century.